She may kill me for revealing her age, but what the heck? Ariana Lallone is 47 years old, and she’s as striking and vibrant as she was the first time I saw her dance with Pacific Northwest Ballet 20 years ago. Ariana Lallone in PNB production of Ulysses Dove's "Red Angels"
If you’ve seen Ariana Lallone in performance, you know she’s unforgettable. She’s 5’11” in her stocking feet, 6’5” en pointe, with dark hair and a Roman nose. 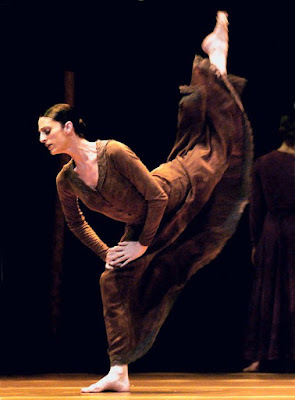 As Lady Capulet in Jean Christophe Maillot’s “Romeo et Juliette”, in Ulysses Dove’s “Red Angels”, or Nacho Duato’s “Jardi Tancat,” Lallone creates an unforgettable impression. But she and PNB Artistic Director Peter Boal didn't see eye to eye on when Lallone should actually leave the company. She wanted to stay longer; he didn't agree. Lucky for her fans, Lallone had the world’s shortest jump from PNB to her next job at Seattle’s Teatro Zinzanni. Literally, she walked across the street and transformed herself from ballerina to cabaret performer. Lallone didn’t even apply for the gig. She’d heard that Zinzanni’s Associate Artistic Director, Reenie Duff, wanted to talk to her about an upcoming show, “Bonsoir Lilliane,” choreographed by Broadway great Tommy Tune. She remembers how that conversation was initiated. Lallone was double parking on Mercer, just outside PNB. Duff turned up at her car, and invited the ballerina to talk. Several hours of yakking later, Lallone's second act was underway. 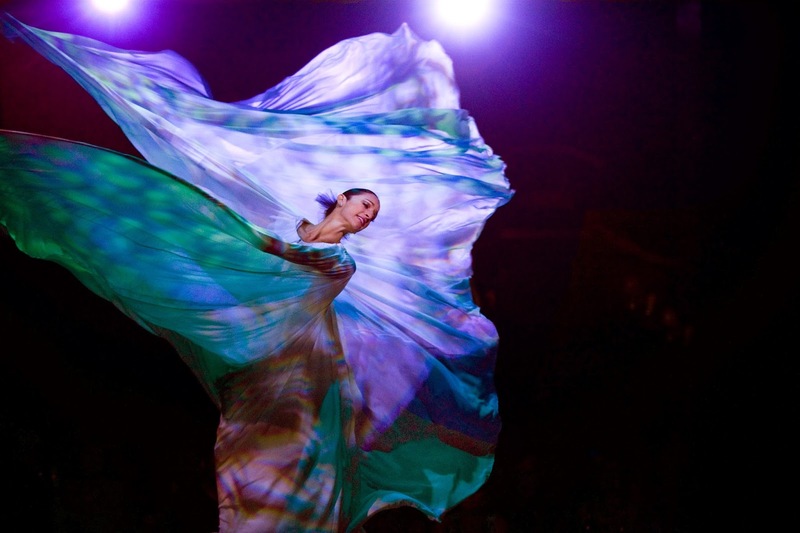 Teatro Zinzanni may be just across the street from McCaw Hall, where PNB performs, but the intimate velvet tent with its antique wooden floor and mirrored walls could be on another planet for all that these two performance venues resemble one another. In McCaw Hall, PNB company members dance for up to 3,000 people. A large orchestra pit is located between the audience and the stage. If you have good seats down front, you can see the dancers’ faces. If not, well, opera glasses are always a good bet at McCaw. 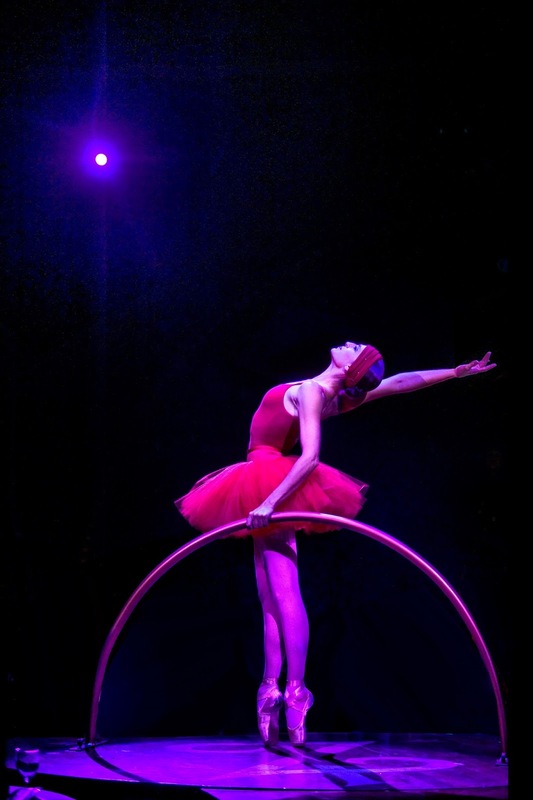 In Zinzanni’s tent, Lallone finds herself on a 9 foot circular stage; she can look right into the eyes of the people who come to the dinner theater. And they can see her. She’s just inches away. It was a challenge at first. But Lallone figured out how to use that proximity to good effect, how to make the eye contact and the intimate surroundings work for her. And she learned that to use her ballet training in that small venue, she had to move her performance into another dimension: up into the air. “I needed a new partner. And the new partner wouldn’t be a person, it would be a thing,” explains the dancer. Specifically, a large metal hoop called a lyra. Lallone took aerial training lessons, and she performs regularly now up above the audience. But Lallone isn’t part of the cast of this summer’s Zinzanni production, “The Return to Chaos.” The show actually marks her first solo foray into choreography. It’s an artistic path that surprised her. The last four years have been a whirlwind for Ariana Lallone. She’s learned new skills, but most of all, she says she’s learned to say yes. But even though you can take the dancer out of the ballet company, you can’t remove decades of ballet from the dancer. Teatro Zinzanni's "The Return to Chaos" is at the tent on lower Queen Anne Hill through mid-September.